Dance of the planets - Jupiter, Venus, Mercury. Three planets have been "dancing" with one another this week - Jupiter, Venus and Mercury. They get closer and closer to one another and before separating in the sky. 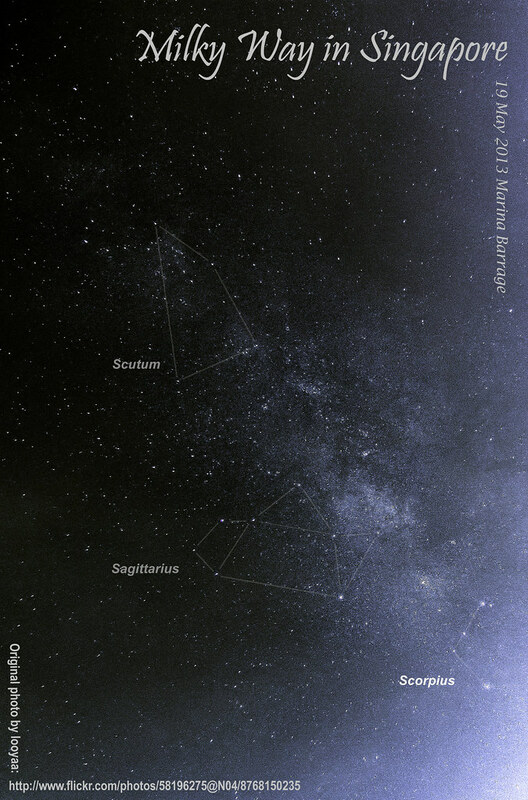 Tonight, 27 May 2013, they will form a nice tight triangle in our western sky. (1) Need the sky to be relatively clear. (2) Venus will be brightest, followed by Jupiter and Mercury. Mercury is the dimmest and most challenging to spot. Need very clear skies. (3) Need unobstructed Western skies where you can see at least 10 degrees above horizon. (4) Use a compass to find and face West-North-West (WNW) - a bit more west of North West. (5) Can try to go up a tall building and look towards the WNW. Do take note of personal safety and do not illegally infringe on private properties. (6) At about 7:30pm in Singapore, they are about a 10 degrees above horizon - approximately the height of your fist in your fully extended arm. (7) They will look like stars in the sky with unaided eyes. May fit inside the whole view in wide-field telescopes and binoculars. (8) Can try to photograph it with your phone camera. At least Venus should be bright enough if the sky is clear enough. With dedicated cameras, the appropriate settings and photography skills, all 3 planets may be captured even if the sky is just not clear enough to be seen with unaided eyes. Milky Way galaxy captured in Singapore! Milky Way, our galaxy, is considered by many to be virtually impossible to see with our unaided eyes in Singapore for many years even on the clearest nights. We know who to "thank" - the ever increasing light-pollution situation in urban cities like ours which is also sad waste of energy and affects human health. Whenever we see photos of Milky Way in local astronomy forums and social media, it is understood that it must be taken in some other countries. Again, a sad but true fact. So imagine our huge surprise when singastro newcomer looyaa (George) posted a photo of Milky Way shot in Singapore recently! And many many stars captured around it too! For a few seconds, I even suspected this might be some kind of an elaborate hoax! Big thanks to George giving me the honour and permission to further post-process his shot. I am not an expert astrophotographer by any stretch of the imagination. So this is my first amateurish attempt. WOW? Yeah. You can say that again. Milky Way is that long fuzzy "cloud" diagonally across the image. Its thickest part is between Sagittarius (looks like a teapot) and the tail of Scorpius. The glow at the right margin and bottom right hand corner of the image is the result of local light pollution cause by nearby lights from a construction site at Marina Barrage. George did not see it visually in the sky while he was shooting it with his Pentax K-30 + DA 12-24mm lens. But he saw many stars which indicates a good chance of capturing it on CCD using long-exposure photography. Even more amazing, these shots were captured WITHOUT a tracking device! In most cases, that will lead to stars trailing instead of being pin-pointed. You can look at the original image by George at his Flickr page. While you are there, check out the rest of his amazing photos - the birds and lightning shots were just wonderfully composed and shot! You can view different sizes of this photo here at my Flickr page. This final image is the result George taking multiple single shots at Marina Barrage and then using software to stack it to increase the signal-to-noise ratio. So this is NOT a fake photo - no stars, nebulae were artificially added or removed in the photo. All post-processing does is to reveal more clearly the photons that traveled for hundreds/thousands of light-years and finally hitting the CCD of someone's camera! For those who are still not convinced, you can double check their positions with your favourite planetarium software (e.g. the free Stellarium). This may not be the first photo of Milky Way captured in Singapore recently but is definitely the best I (and a few other local amateur astronomers) have seen so far. Mr He Chua An also captured an exciting glimpse of its thickest part in this photo in August 2012 at Sembawang. Light pollution is totally REVERSIBLE! It was still visible here only a few decades ago! So please show this photo to all your friends especially those staying in Singapore. 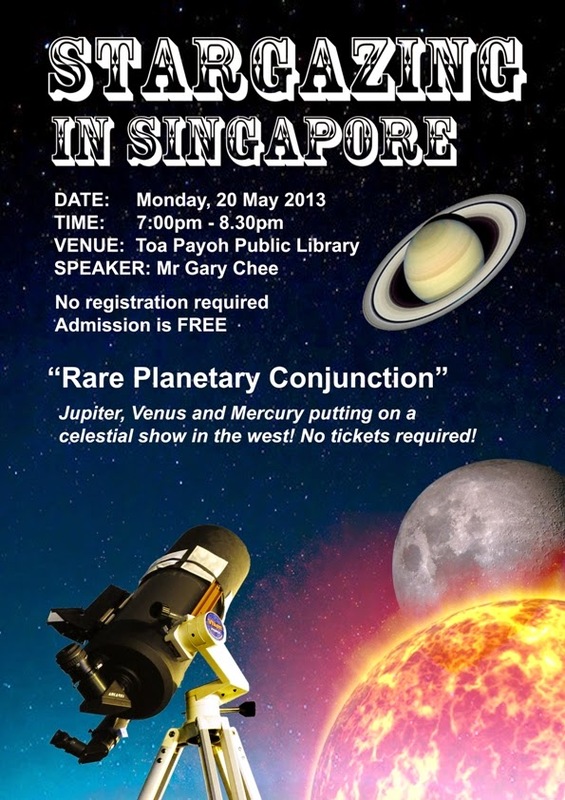 Do you want to see our galaxy directly with you eyes someday right here in Singapore? And share that amazing moment with your love ones? If you want that badly enough, you can do something about it. Take up the stargazing hobby. Share it with your family, friends and the public. Educate yourself about light pollution. Spread the word. 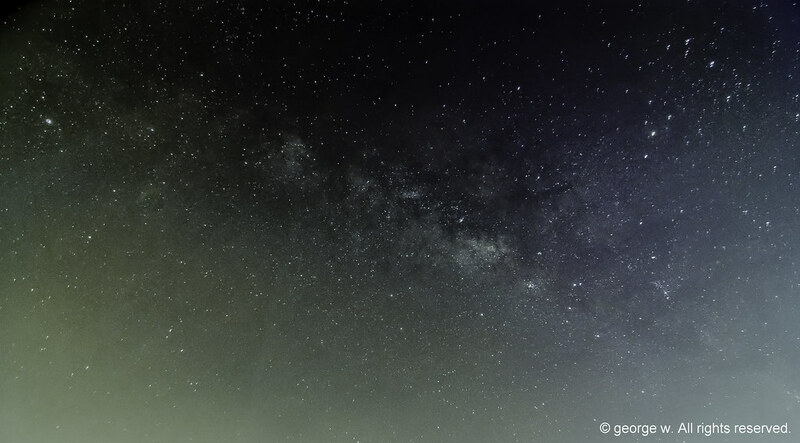 George shot and processed an even better photo of Milky Way captured right here in Singapore on 2nd of June! Check out the source of this photo for higher resolutions at George's Flickr account. Unlike a big bright Moon on a clear night, it is difficult to capture a decent image of Saturn through a mobile phone. Most of the time, all you will see is an over-exposed featureless ball with a featureless over-exposed bright ring around it. And that is provided you have enough patience and good hand-eye coordination to hold your phone camera still and at the exact spot over the eyepiece of the telescope. But still, some are just happy that I managed to help them to capture some sort of ring structure surrounding a ball in their phone. Especially after seeing Saturn live through the telescope for the first time. 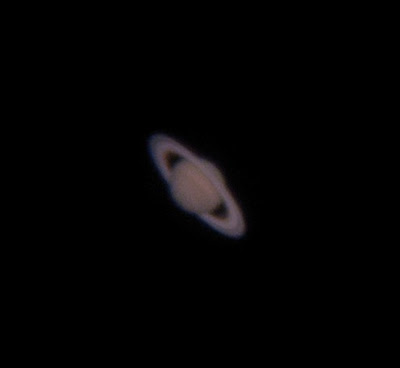 Personally, I have given up trying to shoot Saturn with my mobile phone after a few attempts through 5-inch/6-inch telescopes without tracking. The usual result, a small bright over-exposed image, is not worth my time. I rather spend those time observing Saturn live. But a recent acquisition of a bigger aperture telescope, a 10-inch dobsonian, made me curious enough to give it a try again. Still, there were some doubts if the image will turn out well. There is no tracking on my dobsonian telescope. At high magnification, it drifts very quickly across the field of view. At lower magnification, the image scale of Saturn may be too small and risk being over-exposed again. Saturn opposition in late April 2013 is a great opportunity. So during the public stargazing session on eve of Labour Day at Bishan Park, I decided to give it a serious try after most of the crowd was gone. Decided to put my patience and hand-eye coordination to the test and go for high magnification at about 312.5x (20mm eyepiece + 5x tele-extender on a telescope with 1250mm focal length). 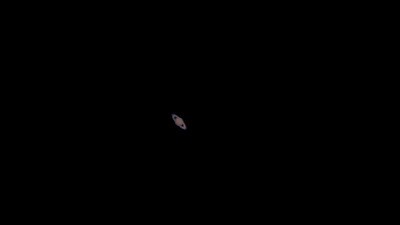 Set my HTC One S exposure value to -2, ISO 100 and fired off about 3 shots the moment I see Saturn appearing on the phone screen. I couldn't believe my eyes! Is that thin black gap in the middle of the ring the Cassini division? Are those really bands of the planet? Did my phone really captured this image? 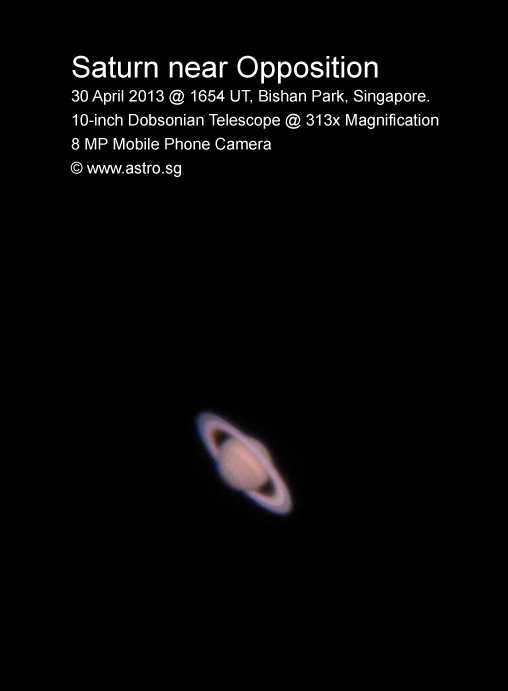 After recovering from the shock, I quickly showed it to my astro buddies at the park and twittered the image. This is final image after some minor photoshop touch-up to bring up the contrast. This image is way better than my first planetary imaging attempt a few years ago with my 5-inch Maksutov-Cassegrain telescope! So glad I challenged my own assumptions about what can be captured via afocal astrophotography with a handheld mobile phone through a sub-$2000 amateur-size non-premium telescope on a non-tracking mount. Now I can't wait for the next Jupiter Opposition!! Topic: Rare Planetary Conjunction - Jupiter, Venus, Mercury. Admission is FREE. No pre-registration required. Late-comers are welcome too! *Weather permitting*, we may be conducting a live stargazing session at the open space outside the Toa Payoh Public Library during and after the talk. On that evening, there will be a beautiful waxing gibbous Moon and the amazing Saturn with its rings and moons. Bright star clusters will be visible too. Have fun observing them through our telescopes! You can even take photos of the Moon with your mobile phone through them! So please bring your family and friends along and enjoy an entertaining and educational evening at Toa Payoh Public Library this coming Monday. See you there! It is not often we read about the local astronomy scene in the mainstream media in Singapore. So I am quite happy to see not one but two reports about local astronomical observatories in today's The Sunday Times (12 May 2013). Firstly, the observatory at Woodlands Galaxy Community Club on page 6 titled "Go star-gazing at Woodlands CC". Prime Minister Lee Hsien Loong was there last night to celebrate the community club's official opening and looked through the telescope at the observatory. Saw the news on TV last night and that's why I bought the papers today. Happy to see JP on TV and in this newspaper report! He was in charge of "explaining the workings" of the observatory to our PM. As usual, sent JP a few whatsapp messages last night to congratulate him on a job well done! - Every Friday & Saturday evening. - Weather permitting. Please check their Twitter or Facebook for latest updates. - $1 charge for public. Free for PASSION card members. This is great publicity for spreading more stargazing awareness in Singapore. Do visit them if you have not done so. According to their Facebook page, there may be an open house event on Monday, 20 May 2013. The other local observatory news is on page 24 titled "Gaze at real stars at NJC (National Junior College)". Found this report online yesterday via a Straits Times tweet. You can read a segment of the report here online. First of all, congratulations to NJC Astronomy Club for their official opening of their observatory! Equally important, for offering research electives such as astrophysics, astrochemistry and astrobiology from this year onwards! Every now and then, we will come across students in our free public stargazing sessions who are interested in astronomy and its related sciences but are disappointed by the limited options to study them and pursue a related career in Singapore. In fact, a 13-year old student was asking about this at the singastro forum recently. So this is definitely good news for those who are keen in such subjects. How I wish these electives were offered during my schooling days many moons ago! 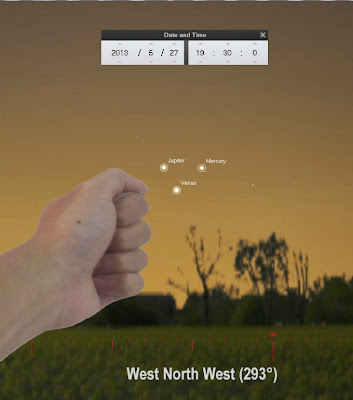 As a promoter of stargazing as an affordable hobby for the general public, I would like to correct a few inaccuracies and potential mis-reading of this article by newcomers like what I did for the Stargazing in New Zealand blog. I guess this amount is either a typo error or the cost of the whole observatory rather than just the telescope. Base on the photos in NJC's Astronomy Club Facebook page and this YouTube video, the telescope should be a 11-inch or 14-inch diameter Schmidt Cassegrain Telescope (SCT) which should only cost about $4,200 or $7,200 respectively before shipping - no where near the $70,000 figure. This is an important issue to clarify as very frequently during our free public stargazing sessions, we have members of public consistently over-estimating the cost of our telescopes. Our telescopes cost from about $500 to $2000. The public usually assume they cost $20,000 or more and that is precisely the this-hobby-is-too-expensive-for-me mindset that is preventing them enjoying the wonders of the universe. There isn't enough public awareness that prices of telescope has dropped quite a lot in the past decade and it is possible to buy an affordable decent beginner telescope locally that cost only about $400+ brand new - or even lower if you don't mind buying used telescopes, e.g. from the SINGASTRO buy-and-sell forum. (2) Takahashi EM-500 Temma II is a mount, not a telescope. This may be a typo error or mis-communication between the teacher-in-charge and the reporter. A telescopic mount is a device which holds a telescope. The mount facilitates the moving of the telescope - it is not an optical instrument. Thus, it cannot provide any clear or wider field-of-views. Takahashi manufactures premium telescopes and mounts among other things. Perhaps in the NJC observatory, there is a Takahashi refractor telescope mounted together with the main SCT telescope as hinted in the above-mentioned YouTube video of NJC's observatory. A refractor telescope generally gives a wider field-of-view than a telescope of SCT design. Maybe this is where the confusion came in during the explanation. A 4-inch Takahashi refractor costs about $4,000 before shipping. Again, even together with the cost of the main SCT telescope, still way under the reported $70,000. "With the new telescope, we can see the rings of Saturn clearly. Previously, (Saturn) was just a dot in the sky." Since the main focus of this article is about an expensive state-of-the-art observatory-class telescope and "previously" was not further elaborated, this sentence may be mis-interpreted by readers who are new to stargazing as the rings and features of Saturn can only be seen in such a big telescope and looking through any telescope that is smaller, you will only see a dot. - Looking at Saturn directly with naked eyes (i.e. without looking through any optical instrument), Saturn does indeed look like a dot of light in the sky like a star. - As long the sky is clear enough, Saturn and its rings can be seen even through small beginner telescope - e.g. a telescope with a 3-inch diameter lens that cost under $400. The rings may look small in the view, but visible as a ring structure nonetheless. - Comparing between telescopes, a telescope with a bigger diameter lens/mirror will give a clearer view (more contrast, brighter, higher resolution) than one with a smaller diameter lens/mirror. "We can also take astrophotographs now We couldn't fix a camera to the portable telescopes." Having access to an observatory and observatory-grade equipment like a heavy-duty highly precise tracking mount no doubt makes astrophotography much easier and enjoyable. But for newcomers who are keen to get started in astrophotography, it can still be done in relatively "portable" setups. What is portable can be quite subjective depending on the physical built/strength of the person, whether he/she has access to private transport or a very good nearby location to do astrophotography. Mounting cameras to telescopes should not be a big issue with the proper adapters unless the visual back of the telescopes does not follow the usual standard opening sizes. The main issues with very portable telescopes is usually weight related - the weight of the camera may cause telescope balancing issues or create too much tracking errors on a weaker telescope mount designed more for portability and visual astronomy. Amateur astronomers globally have consistently produced great astrophotos using relatively portable setups. For example, a 3-inch refractor with a short body and an equatorial tracking mount that can be packed into medium size luggage bag. Some of them have even further optimise their astrophotography setups and made them airline portable so that they can travel to locations with darker clearer skies and take better astrophotos. Wish there was more elaboration of the astro related electives in the report but I guess those who are interested can contact National Junior College directly to find out more info. Hopefully, other educational institutions without an astronomy club can start one soon and offer their students an opportunity to study astronomy related sciences after reading such reports. Having an observatory is great when starting an astronomy club but should not be perceived as a compulsory requirement. With proper research, fund-raising and planning, a few decent amateur-size and relatively portable telescopes will be sufficient to start the ball rolling. Just like how Woodlands Galaxy Community Club and NJC astronomy club started years ago. It was reported in the Chinese ZaoBao newspaper published on the same day that the telescope is a 14-inch SCT. News of the observatories were also published in the Malay newspaper Berita Harian and the evening chinese papers.